Hay Net fully encloses an entire 4 foot x 4 foot round bale. 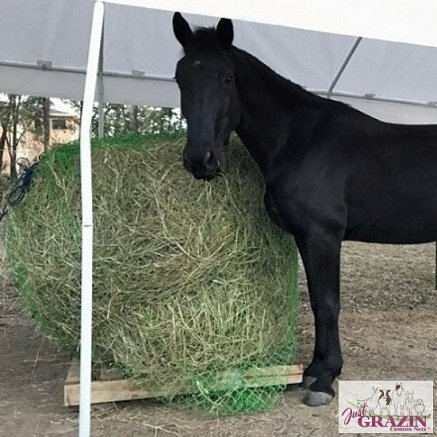 ..."Our Sheep, lambs, kids and horses all love Just Grazin Custom Nets"... - Claudette R *All round bale nets come with a complimentary patch kit. Unfortunately, sometimes accidents can happen. Should your net be damaged in any way for any reason, we have provided this patch kit for instant repair. 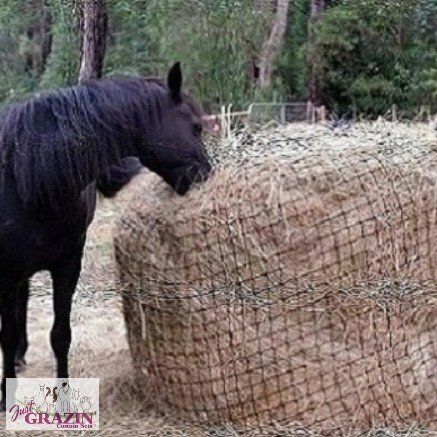 *Benefits of using slow feed hay nets include - Reduce hay wastage, slowed hay consumption, simulate grazin’. Continuous slow feeding helps reduce the chance of colic, choke, stomach ulcers, decrease’s boredom and may improve stable vices. ..."Just Grazin Custom Nets are the bees knees & great for feeding out. 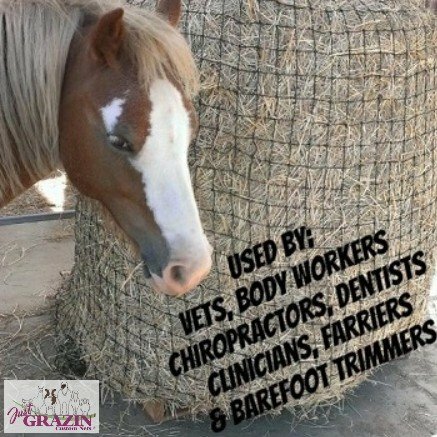 Highly recommend"... - Melissa Longhurst, Equine Body Balance *All round bale nets come with a complimentary patch kit. Unfortunately, sometimes accidents can happen. Should your net be damaged in any way for any reason, we have provided this patch kit for instant repair. *Benefits of using slow feed hay nets include - Reduce hay wastage, slowed hay consumption, simulate grazin’. Continuous slow feeding helps reduce the chance of colic, choke, stomach ulcers, decrease’s boredom and may improve stable vices. ..."These are fantastic. I bought the 6cm Tuff Style 60ply round bale one 3 months ago for 2 rowdy geldings, its still going well no problems at all. 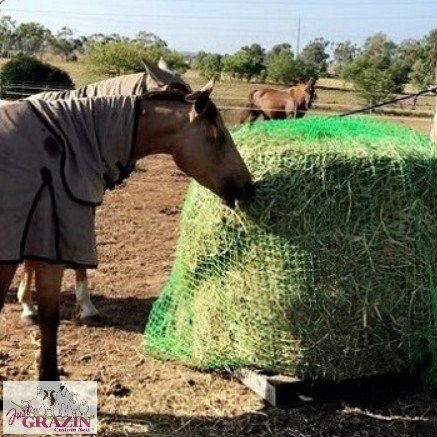 Would definitely recommend them for horse owners"... - Jenni T *All round bale nets come with a complimentary patch kit. Unfortunately, sometimes accidents can happen. Should your net be damaged in any way for any reason, we have provided this patch kit for instant repair. 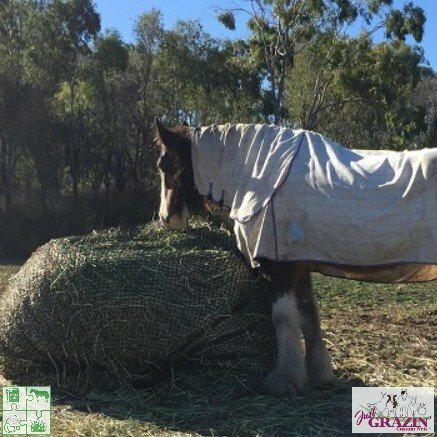 *Benefits of using slow feed hay nets include - Reduce hay wastage, slowed hay consumption, simulate grazin’. Continuous slow feeding helps reduce the chance of colic, choke, stomach ulcers, decrease’s boredom and may improve stable vices. Hay Net fully encloses an entire 5 foot x 4 foot round bale. Hay Net fully encloses an entire 6 foot x 4 foot round bale. ..."The round bale is now going to last longer thanks to Just Grazin hay nets!"... 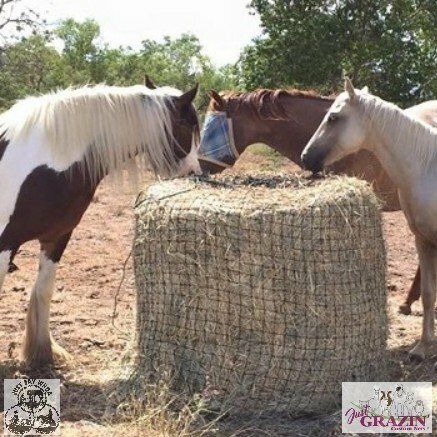 Jane Stephens - Horse Utopia *All round bale nets come with a complimentary patch kit. Unfortunately, sometimes accidents can happen. Should your net be damaged in any way for any reason, we have provided this patch kit for instant repair. 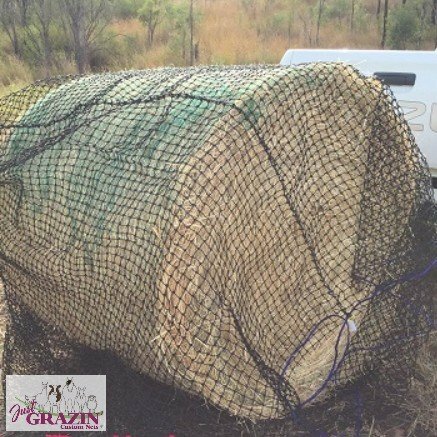 *Benefits of using slow feed hay nets include - Reduce hay wastage, slowed hay consumption, simulate grazin’. Continuous slow feeding helps reduce the chance of colic, choke, stomach ulcers, decrease’s boredom and may improve stable vices.